November 14, 2017 Rancho Tehama Mass Shooting Not Terrorist Attack Kevin Neal​ opened fire at Rancho Tehama School in Corning Californa , killing five people before he was killed by police. The shooting started at a home where he killed his wife Barbara Glisan. and 3 neighbors and moved to the elementary school in Tehama County​ at around 8 am. The shooter was killed by law enforcement. A man reported that his truck was stolen and his roommate was shot and killed by the gunman earlier in the morning. Authorities announced they believe he as angry at his neighbors and was not a terrorist attack. names of the victims in the shooting have not been released. Alternative theory: He is terrorist hiding a motive. Killing wife and mad at neighbors is cover story for mass killing attack on US city. Terrorist theory: The mass shooting in the last three months are not random but well organized terror attacks to avenge the killing of taliban fighters at the hands of U.S. Stephen paddock, omar mateen and saifulla saipov all lived in the tampa-orlando, florida area between 2013- 2015 and then all them committed mass murder in within a span of 1 year this is not coincidence. arrests arrested numerous times in California and North Carolina for such crimes as drug sales and hit-and-run driving, Tehama County District Attorney Gregg Cohen said. armor house: Neal draped a giant metal awning across the front of the house as if to armor himself from the outside world. cal fire complaint Cal Fire to complain that the two women were making methamphetamine. charges charged with assaulting — with a gun and a — and falsely imprisoning two women in Tehama County. dispute: was in a long-running dispute with neighbors he believed were cooking methamphetamine. drug addiction Family sister believes her brother was addicted to drugs. guns: Neal was armed with one semiautomatic AR assault-style rifle and two handguns and that a second rifle was later discovered during a search. gun ban: Court documents show Northern California shooter was prohibited from having guns as part of restraining order. illegal guns latimes Tehama County judgeordered Neal to surrender all firearms. He did not legally own any of the guns, Johnston said. The two rifles were “manufactured illegally by him in his home” and unregistered, and the pistols were registered to another person, he said. suspect: suspect was Kevin Janson Neal, 43. Tehama school: . About 100 students attend Rancho Tehama School, only 4 teachers. terrorist Tehama Terrorism requires a political or ...Tehama- Mass shootings are a form of domestic terror. gunman he doesn't think there is any connection to terrorism. 4 shot in driveway near original house? wife: wife's body Neal worked as a pot farmer and had recently married his wife unidentified. Found under floorboards on wed found dead believes his nephew had gottenmarried after moving to California. shot several times, was hidden beneath the floor. “We believe that’s what probably started this whole event,” Tehama County Asst. Sheriff Phil Johnston told reporters Wednesday. Barbara Glisan. Stabbed neighbor, out on bail. Sheriff told them to contact the HOA. Two people were found dead at the first shooting scene and another person was killed after the suspect rammed their vehicle and fired at the occupants, Johnston said. living near him has been hell. staff at the school heard gunshots around a quarter-mile away and initiated a lockdown. took his vehicle and rammed their fence and gate, entered the grounds on foot with a semiautomatic rifle,"
domestic violence terrorist spree charged with assault with a deadly weapon against a woman in January, and that woman is among the four people killed Tuesday, Johnston said. his neighbor, whom he knows only as Kevin, was the gunman and that his roommate was among the victims. He said the shooter also stole his truck. unman was wearing “a load bearing vest that you sometimes see soldiers wear that have the clips embedded in the chest," Johnston said. shot at a number of classrooms, he said. Johnston said the shooting is not believed to be terrorism related, and "this is an individual that armed himself, I think with the motive of getting even with his neighbors." felony - no conviction Neal did not have a felony conviction against him that would have prevented him from owning a gun, Johnston said. guns: Neal was armed with one semiautomatic AR assault-style rifle and two handguns and that a second rifle was later discovered during a search. At least three weapons were used in the shooting, Johnston said. Johnston said there was another gun found in the pickup the shooter was driving. motive in the shooting is unclear “I think the motive of getting even with his neighbors and when it went that far — he just went on a rampage,” Johnston said "This man was very, very intent on completing what he set out to do today," Johnston said. "The shooter was bent on killing and shooting people at random." protective order Rancho Tehama gunman targeted wife, neighbor before attacking ... latimes Neal and his wife, Barbara Glisan, obtained a protective order against a male neighbor, whom they accused of threatening them with a gun and m anufacturing methamphetamine. restraining order restraining order was issued after Neal continued to harass his two victims after he got out of jail, Cohen said. The harassment included calling Cal Fire to complain that the two women were making methamphetamine. stepson Court Neal had verbally abused each of them, including the stepson. Rancho Tehama elementary school school: . About 100 students attend Rancho Tehama School, only 4 teachers. Killed at home at start of spree Danny Lee Elliot, 38 Poland's boyfriend. Lived with mother Diana Lee Steele and father-in-law (in court records, his name is listed as Danny Lee Elliott II) Who are the Victims of the Rancho Tehama Shooting? | FOX40 dad to his young son Gage Elliott and a man devoted to his ... Rancho Tehama shooter neighbor describes tensions redding Elliot, 38, and his mother, Diana Lee Steele, 68, were among the first Neal killed before he went on his rampage, firing at people randomly on ...Kevin Janson Neal before Tuesday's deadly assault, had threatened out loud he was going to kill his neighbor and after would kill his 7-year-old son at school. Johnny Phommathep said the threats made to Danny Lee Elliot may reveal Neal's motive for shooting up the classrooms at Rancho Tehama Elementary School. cbsnews Victims Danny Elliot and Diana Steele, a mother and her adult son, were gunned down in their home, according to a fundraising page for Elliot's son Gage, 7, who attended the elementary school Neal targeted. The boy was not injured. / Named as protected Poland's mother and father-in-law, who both lived with Poland on Bobcat Lane, Poland's 38-year-old boyfriend Danny Lee Elliot, 38 years old and his 7-year-old son, who was also Poland's stepson. Elliot's girlfriend, Hailey Suzanne Poland 'I will kill you': Neighbor recalls California shooter's threats - CNN Volunteer firefighter Johnny Phommathep could hear the trouble next door loud and clear. The screaming. The threats. Killed at home at start of spree Diana Lee Steele, 68 mother of Danny Lee Elliot Neal had reportedly assaulted Steele, who was his neighbor, in January in an incident in which he also stabbed Elliot's girlfriend, Hailey Suzanne Poland. Elliot's mom, Diana Lee Steele, 68, was also killed. Joseph Edward McHugh III, age 56 - Gun Memorial (shot in unknown location) New York Times Brian Flint let his roommate borrow his truck, and the man was returning it when he was shot in the driveway. roommate had just turned 57-years-old Brian Flint said he got a call in the morning that his roommate was injured and that his truck had been stolen. It turned out his neighbor was the gunman. Brian Flint He lived two doors down from suspect Flint described Kevin as a crazy dangerous man and spoke about how Kevin would shoot up to 100 rounds of gunfire every night and morning. "All I know is that the guy shoots a lot of shots and it's just crazy. I would hope that there would be more effort into preventing things like this. The police came around my house a lot recently, maybe it was for gunshots, maybe not, not sure but you know, there just needs to be more of an effort for things like this to be prevented," said Flint. Flint said that his roommate had just turned 57-years-old and was a very nice man. He said he felt guilty knowing that the suspect used his car to carry out such a horrendous act. Flint learned of the shooting via a phone call early Tuesday. When asked how he was feeling, he replied: "I just feel like maybe there should’ve been more effort put into potentially stopping things like this." A “semi-automatic rifle and two handguns” have been recovered by authorities, he added.
? roommate who returned truck was shot??? kron4 was raised in Cary and went to East Carolina University. family told CBS North Carolina that Neal was very smart, but “troubled.” sister, Sheridan Orr, told the Associated Press her brother had struggled with mental illness throughout his life and at times had a violent temper. 5 years: kron4 Neal and his mother had not seen each other in 5 years but talked daily and were close. january: judge had issued a restraining order against the gunman after the dispute with the neighbor in January. Neal was arrested on Jan. 31 for the incident with his neighbors in which he reportedly shot through a fence at two women, according to the Red Bluff Daily News. In December 2015, a then-43-year-old woman was arrested after a school employee called law enforcement because she allegedly was walking around with a sawed-off shotgun. The woman also was arrested, in part, because deputies said they found a stolen pickup in her yard. Neal opened fire on the neighbors as they walked along a wooden fence. He jumped over the fence, stabbed one of the women and then took the other's cellphone, the prosecutor said. accused of stabbing a female neighbor in the abdomen. The charges — which include assault with a deadly weapon and second-degree robbery — were pending, and the neighbor was among the first to be killed Tuesday. Mother says he was threatened cut after Neal grabbed a steak knife she was using to threaten him. mother asked that only her first name, Anne, be used because she feared for her safety due to her son’s feuding with neighbors he claimed were involved with gangs. She was unaware of her son’s role in the rampage until contacted by AP.her last few talks with her son, Neal’s mother said he sounded desperate and despairing over his relationship with his neighbors, who he said were cooking meth and creating fumes that were harming his nine dogs. Neal’s mother said her son told her the neighbor was only slightly cut after Neal grabbed a steak knife she was using to threaten him. cal fire complaint Neal called Cal Fire to complain that the two women were making methamphetamine. protective order Rancho Tehama gunman targeted wife, neighbor before attacking ... latimes Neal and his wife, Barbara Glisan, obtained a protective order against a male neighbor, whom they accused of threatening them with a gun and manufacturing methamphetamine. May 22, 2017 Neal made bail of $160,000 on His next court date would have been December 15, 2017, where he would have faced up to sixteen and a half years in prison krcrtv mother paid for lawyer and bail Family mother posted his $160,000 bail and spent $10,000 on a lawyer after he was arrested in January for stabbing a neighbor. mother told The Associated Press her son, who was a marijuana grower, was in a long-running dispute with neighbors he believed were cooking methamphetamine. Police try to follow up on gun complaints: Neighbors had also complained about Neal shooting guns at his home on Bobcat Lane in Rancho Tehama, about 15 miles southwest of Red Bluff. Johnston said deputies went to Neal’s home more than once but were unable to find him. They also set up surveillance outside his home hoping to catch him redding Neal was well-known to local authorities who watched him but could not talk to him. His neighbors, on multiple occasions, reported shots coming from his house. At least twice, Johnston, said, officers put the house under surveillance. “We can’t anticipate what people are going to do,” Johnston said. “We don’t have a crystal ball…. We wanted to make contact. He is not law enforcement friendly, and he [knew] not to come to his door. latimes is about a 45-minute response to the reserve, he said. "They would come past my house and it had already stopped," he said. "This guy was intelligent and strategic. I don't know how he did it, but he always knew before (law enforcement) came." cnn: deputies did go out to Neal's a few times after being called due to gunfire or disturbances. They knocked on the door. He didn't open it. They staked out his house but left when they heard no signs of gunfire. "He was a smart guy. He was playing a game of chess with police," Phommathep said. "Someone would call because he was shooting. And Neal would stop just before police got there. When the cops were gone, he'd start again." 4 or 5 days before: Four or five days before Tuesday's shootings that left five people dead and 12 others injured, Phommathep remembers a heated conversation between a husband and wife who lived next door. cnn"We heard a scream," he recalls. "Why did you shoot my dog, Kevin?" subject of a domestic violence call the day before the attack. Police had also visited Neal’s house a day before the shootings on a domestic violence call, authorities said, but gave no details. We believe this is what started the whole event,” Johnston said of Neal’s wife’s murder, and the subsequent rampage the man later went on. Neal shot and killed Gage's father, Elliot, and grandmother, Diana Steele, before heading to the school. But the boy was already scared of Neal. Gage recalled that Neal previously shot at his home "three times a day." cnn 8 a.m. near Bobcat and Fawn lanes where Neal shot two people dead and stole a car. Neal began his rampage near his home on Bobcat Lane in the Rancho Tehama Reserve at 7.52am, shooting people at random before stealing a truck and performing drive-by shootings on homes, pedestrians and other drivers. sacbee Francisco Cardenas, the husband of her cousin, who was shot in the leg and up through the groin, striking an artery. Cardenas had been on his way to the post office that morning and pulled to the side of the road when he heard police sirens, according to the campaign page. The shooter pulled alongside him and shot into the car. Cardenas fled on foot despite the injury and managed to escape. He was later airlifted to Mercy Medical Center in Redding, where he underwent surgery. The last update said he was breathing on his own but is still hospitalized. Brian Flint got call about shooting, drove home to see police man staying in his house was one of those killed and that some of his neighbors were among those who were shot. boyfriend? 8 a.m. law enforcement called to tell them to lock their doors and shelter in place. Bobcat lane Neal fired at several people, killing one man in his driveway. officials received multiple 911 calls about gunfire at an intersection of two dirt roads. Minutes later, more calls reporting shots flooded in from different locations, including the school. 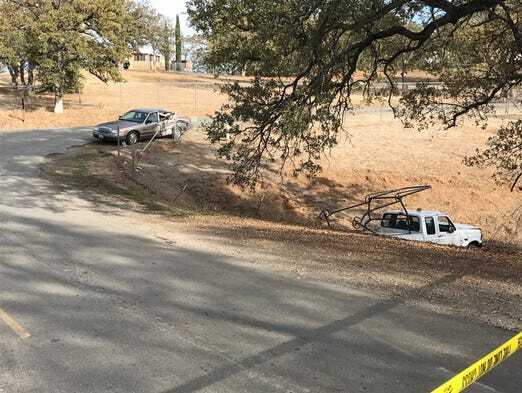 On his way through the town, he shot a woman and her child in their F-250 truck rancho tehama rd The mother suffered life-threatening wounds and remains in hospital, towed away with bullet holes in door. latimes Neal fired eight rounds into a Ford F-250 occupied by a mother and her son who were headed to school. The boy suffered non-life-threatening wounds, but the mother was seriously injured, Johnston said. The mother, who had a concealed carry permit, pulled out her own handgun but was unable to fire it before Neal drove away, Johnston said. A child in the backseat of the car was shot and suffered injuries that Johnston described as “not life threatening.” The woman driving the vehicle, however, sustained “very life threatening” injuries, Johnston said. The woman was attempting to drive herself to the hospital when she encountered Johnston. She told him she didn’t know the suspect, but he opened fire when she was passing by him. The child’s injury was either the result of a gunshot or shrapnel from the bullet hitting the car, Johnston said. spent about six minutes shooting into Rancho Tehama Elementary School before driving off to continue shooting. School was NOT a random target. heard multiple shots, starting with about 10, and proceeding to about 90 shots, of a high powered some kind of rifle sounding. One told how he saw a woman shot dead in the street next to her husband. dailymail Neal left the school, he went to a different location and intentionally crashed the pickup into a ford crown victoria left rear car,ran off road and exited the vehicle. He proceeded to gun down [two killing woman ] at that location. redding Mike McFadyen, 59, spoke to the Record Searchlight his brother and sister-in-law Troy and Michelle McFadyen were forced off the road and into a ditch by a vehicle coming at them head-on. The gunman then parked the vehicle, walked toward them and fired into their car , his brother and sister-in-law were forced off the road and into a ditch by a vehicle coming at them head-on. The gunman then parked the vehicle, walked toward them and fired into their car. With no way of defending themselves, they ran for their lives, said Eric McFadyen, their nephew and Mike's son, on a GoFundMe page. But the gunman ran them down until they fell to the ground. Rancho Tehama shooting: ‘Run! Run! Let’s go!’ man told wife before being hit Detroit free press still vividly remembers the shooter running him off the road, methodically killing his wife, Michelle, shooting him twice and leaving them both in a ditch by the side of the road. truck coming toward me, just missing me,” McFadyen said. “And being shot and watching my wife.”said he and his wife were driving out of town Tuesday morning for a doctor’s appointment when they saw a white pickup coming down the road toward them. The driver crossed into the oncoming lane, as if to crash head-on into the McFadyens. We’re panicked and the gunfire is just coming, he’s coming up the hill, firing his gun,” he said. McFadyen and his wife became separated. She fell in a ditch, while he headed up Stagecoach Road on foot. He looked up and saw the man firing at him. One of the bullets hit his left leg and went through his thigh. The shot stung, but he could still walk. A car drove by and McFadyen tried to get them to let him in, but they locked their doors and drove off, he said. As McFadyen ran, Neal shot him in the right lower leg, shattering bones. He fell in the road and tried to sit up. At that point, Michelle McFadyen came up the road toward him and Neal began firing at her. She falls in the ditch and he walks up rather casually and puts two rounds in her. All the while I’m screaming, ‘Please don’t! Please don’t!’” McFadyen said. Michelle made a noise, so he turned back and shot her at least two more times, he said. “So after he shoots her a second time he turns around and starts coming toward me again. At which point I lay back on my back and I say ‘I’m dead! I’m dead! I’m dead! '” McFadyen said. ppeared to lose interest and walked back down the road and got into a gray car. McFadyen said he wasn’t sure where the gray car came from. Neal then got back on the road, where he chased a couple in another car and crashed into their vehicle, authorities said. When they got out, Neal shot them, killing one. Resident Salvador Tello said he was taking his three children to Rancho Tehama Elementary School when the gunman fired at a truck in front of him. Tello saw bullets hit the truck in front of him, so he made his children get down and put his truck in reverse. As he left, Tello said, he saw a woman lying dead in the street with her husband next to her, McFadyen, apparently wounded. (Francisco Gudino Cardenas, according to a GoFundMe page, was in his car on his way to the post office when he pulled over to make way for sheriff's officials, who unbeknownst to him were in pursuit of the gunman. The shooter pulled up next to Cardenas and shot him in the leg, striking an artery that caused major blood loss, the page said. When the gunman began shooting at police officers, they rammed his car and ran it off the road. rt ramming his vehicle, forcing it off the road, and then two deputies killed him in a shootout. A shootout ensued, and Neal was killed. tue night wife's body Neal worked as a pot farmer and had recently married his wife unidentified. Found under floorboards on wed found dead believes his nephew had gottenmarried after moving to California. shot several times, was hidden beneath the floor. “We believe that’s what probably started this whole event,” Tehama County Asst. Sheriff Phil Johnston told reporters Wednesday. www.dailymail.co.uk/news/.../Three-dead-shooting-California-elementary-school.html2 days ago - The California gunman who killed at least four people and hospitalized 10 ... Neal eventually arrived at the Rancho Tehama Elementary School and .... deadly when Neal fired at several people, killing one man in his driveway. Rancho Tehama Reserve, California, U.S.
On November 13 and 14, 2017, a series of shootings occurred in Rancho Tehama Reserve, an unincorporated community in California. Rancho Tehama Reserve is located 120 miles (190 kilometers) northwest of Sacramento. During the shooting spree, five people were killed and twelve others were injured at eight separate crime scenes, including an elementary school. The gunman, later identified as 44-year-old Kevin Janson Neal, was shot and killed by sheriff's deputies after a brief chase in a stolen vehicle. The rampage started in Rancho Tehama Reserve after Neal killed his wife on November 13 and hid her body under the floorboards of their home. The next day, November 14, he killed a man and a woman, both neighbors with whom he had an ongoing feud regarding suspected methamphetamine dealing. After killing his neighbors, Neal stole a pickup truck that belonged to one of his victims. He then began firing at random vehicles and pedestrians. At an intersection, he bumped the truck into a vehicle carrying a woman and her three sons, drove up to the driver's side, and fired into it, injuring all of them with gunshots or flying glass. Neal then crashed the pickup truck through the front gates of Rancho Tehama Elementary School, got out with an AR-15-type semi-automatic rifle, ran into the center of the school's quad, and fired repeatedly at windows and walls. One student hiding under a classroom desk was shot and injured by a bullet that tore through a wall. A six-year-old student was also injured by a gunshot to the chest at the school. A woman was also shot when she attempted to distract Neal from the school. Further injuries and deaths were prevented because the school was placed on lockdown by a custodian when shots were first heard. Nearly 100 rounds of ammunition were fired at the school. Afterwards, Neal apparently discarded the rifle outside the school. After fleeing the school, Neal crashed the pickup truck into another vehicle and fired upon the two occupants as they tried to flee; the female driver was killed and her husband was wounded in the legs. The man survived after pleading with Neal for his life. A passerby unaware of the shootings stopped his car and asked Neal if he was okay; Neal shot and wounded him, stole his car, and continued the rampage, killing another person. Eventually, Neal was shot and killed by two Tehama County sheriff deputies after a brief vehicle chase. The 25-minute attack was spread over eight crime scenes using one semi-automatic rifle and two semi-automatic pistols. His motive is unclear. Two handguns and another AR-15-type rifle were recovered near his body. Five people were killed on the day of the shooting spree, including Neal, who was shot by two deputy sheriffs. A sixth body, that of Neal's wife, 38-year-old Barbara Glisan, was later discovered under the floorboards of their home; she was believed to have been killed the day before. Neal's first two victims killed on November 14 were his neighbors, 38-year-old Danny Elliott and 68-year-old Diana Steele, who he had previous conflicts with. The other victims were 56-year-old Joseph McHugh III and 55-year-old Michelle McFayden; police believe they were randomly selected. Twelve other people – six adults and six children – were directly wounded. They were taken to Enloe Medical Center in Chico, Mercy Medical Center in Redding, or UC Davis Medical Center in Davis for treatment. They included two students at Rancho Tehama Elementary School and Michelle McFayden's husband. One of the injured students, six-year-old Alejandro Hernandez, was the youngest victim; he was shot in the chest and leg and had to be airlifted to UC Davis, where he still requires surgery. In addition to those twelve injured, six others suffered injuries from shattered glass. Because Rancho Tehama Reserve is stricken with poverty and is located far from towns with stores, medical care, and social services, victims' families were left struggling to pay for medical expenses. As a result, they turned to using online fundraisers. Kevin Janson Neal (1973 – November 14, 2017) was raised in Cary, North Carolina. He attended East Carolina University from August 2001 to May 2004, but did not qualify for a degree and never declared a major. Relatives said Neal, who moved to California in 2005, had a history of mental illness and anger management issues, as well as an obsession with conspiracy theories. His mother reportedly noticed a decline in his mental health since 2016. Neighbors complained to police about Neal firing guns from his property, but whenever officers visited his doorstep, Neal would not respond to their knocking. A neighbor later said he believed Neal might have been testing the response time of law enforcement. On January 31, 2017, Neal was arrested and charged with stabbing a neighbor, and then assaulting her mother-in-law.He was held on a US$160,000 bail, which was posted by his mother. Following his release, Neal continued to harass the neighbors, causing them to successfully seek a restraining order that required him to surrender his firearms and not purchase additional ones. Police said that, despite this, he illegally manufactured the guns he used in the shootings. The day before the shootings, Neal called his mother to tell her he was "fed up" with his neighbors, whom he suspected of making methamphetamine. He had previously attempted to report his neighbors to the California Department of Forestry and Fire Protection. One of the neighbors involved in the January 31 incident later went on to be one of those killed in the shootings. Governor Jerry Brown, and his wife Anne, offered condolences to all of the victims and their families. The shootings renewed attention on the legality of "ghost guns", which were used by Neal. Due to the shooting spree, Rancho Tehama Elementary School was closed earlier than planned for its Thanksgiving holiday break. ^ Jump up to:a b c "Rancho Tehama gunman killed his wife and hid her body under their home, authorities say". Los Angeles Times. November 15, 2017. Archived from the original on November 15, 2017. Retrieved November 15, 2017. ^ Jump up to:a b c Greene, Leonard (November 16, 2017). "Calif. rampage survivor talked gunman out of firing final shot". AOL News. Archived from the original on November 17, 2017. Retrieved November 17, 2017. ^ Jump up to:a b c d e f Shyong, Frank; Panzar, Javier; Serna, Joseph; Saint John, Paige (November 14, 2017). "Terror in Northern California town as gunman goes on rampage, sprays school will bullets". Los Angeles Times. Retrieved November 15,2017. ^ Jump up to:a b c d e Kasler, Dale; Sabalow, Ryan; Chabria, Anita (November 14, 2017). "Locked out of school, Tehama County gunman shot at children from outside". The Sacramento Bee. Archived from the original on November 15, 2017. Retrieved November 15, 2017. ^ Jump up to:a b c d e f Chabria, Anita; Sabalow, Ryan (November 17, 2017). "Poor and isolated, victims of Tehama shooter turn to the internet for help". Sacramento Bee. Archived from the original on November 18, 2017. Retrieved November 17, 2017. ^ Jump up to:a b c d e f Branson-Potts, Hailey (November 17, 2017). "Mother driving her boys to school when Rancho Tehama gunman struck shielded her son despite her wounds". Los Angeles Times. Archived from the original on November 18, 2017. Retrieved November 17, 2017. ^ Jump up to:a b c d Blankenstein, Andrew; Siemaszko, Corky (November 17, 2017). "California mass shooter made his own rifles". AOL News. Archived from the original on November 18, 2017. Retrieved November 17, 2017. ^ Jump up to:a b c Branson-Potts, Hailey; Vives, Ruben; Serna, Joseph; St. John, Paige (November 16, 2017). "Rancho Tehama gunman targeted wife, neighbor before attacking passersby at random". Los Angeles Times. Retrieved November 17,2017. ^ Jump up to:a b Zendehnam, Sara (November 16, 2017). "Who are the Victims of the Rancho Tehama Shooting?". KTXL. Archived from the original on November 18, 2017. Retrieved November 17, 2017. Jump up^ St. John, Paige; Tchekmedyian, Alene (November 15, 2017). "Despite court order to give up weapons, Tehama gunman fired guns with impunity, frightening neighbors". Los Angeles Times. Archived from the original on November 16, 2017. Retrieved November 16, 2017. ^ Jump up to:a b Rodriguez, Olga R. (November 16, 2017). "Shooter Ran Victims Off the Road and Chased Them on Foot, Family Says". Time. Archived from the original on November 17, 2017. Retrieved November 16, 2017. Jump up^ Pike, Haleigh (November 14, 2017). "Officials: Five dead, 10 injured in Rancho Tehama mass shooting". KRCR-TV. Archived from the original on November 16, 2017. Retrieved November 16, 2017. ^ Jump up to:a b "California shooting gunman's neighbor lived in fear of him". CBS News. November 16, 2017. Archived from the original on November 17, 2017. Retrieved November 16, 2017. ^ Jump up to:a b Chan, Stella; Mossburg, Cheri; Sanchez, Ray; Almasy, Steve (November 14, 2017). "4 dead after California shooting; gunman tried to enter school". CNN. Archived from the original on November 14, 2017. Retrieved November 15, 2017. ^ Jump up to:a b Helsel, Phil; Abdelkader, Rima; Dong, Shanshan (November 14, 2017). "Gunman kills four, wounds child at school in California shootings". NBC News. Archived from the original on November 14, 2017. Retrieved November 15, 2017. ^ Jump up to:a b "Red Bluff deadly shooting: Gunman identified". ABC7 Los Angeles. November 14, 2017. Archived from the original on November 15, 2017. Retrieved November 15, 2017. ^ Jump up to:a b Domonoske, Camila; Gonzales, Richard (November 14, 2017). "At Least 4 Victims Killed After Shooting At School, Other Locations In California". NPR.org. Archived from the original on November 14, 2017. Retrieved November 15, 2017. Jump up^ Espino (November 15, 2017). "California shooting victims' families turn to GoFundMe for help". USA Today. Archived from the original on November 16, 2017. Retrieved November 15, 2017. ^ Jump up to:a b c Schultz, Jim; Longoria, Sean (November 15, 2017). "California mass shooting suspect killed wife, hid body day before rampage, officials say". USA Today. Redding Record Searchlight. Archived from the original on November 16, 2017. Retrieved November 17, 2017. Jump up^ "Gunman in Fatal California Shooting Raised in Raleigh". WWAY. November 15, 2017. Retrieved November 16, 2017. ^ Jump up to:a b c Karimi, Faith; Andone, Dakin (November 16, 2017). "California shooting gunman was 'paranoid,' DA says". CNN. Archived from the original on November 16, 2017. Retrieved November 16, 2017. Jump up^ Thompson, Don; Elias, Paul; Gecker, Jocelyn; Har, Janie; Rodriguez, Olga; Balsamo, Michael; Shafner, Rhonda (November 14, 2017). "Tehama County shooting update: Gunman's wife found dead". The Mercury News. Associated Press. Archived from the original on November 14, 2017. Retrieved November 17,2017. Jump up^ "Shooting rampage in California highlights "ghost guns" and their dangers". CBS News. November 16, 2017. Archived from the original on November 17, 2017. Retrieved November 16, 2017. Wikipedia List of school shootings November 14, 2017 Rancho Tehama Reserve, California 5 2 Northern California Elementary School: Five Students were fatally shot by a gunman who appeared to "fire at random" and "did not have motive for the attack." Authorities said the gunfire began around 8 a.m., and a semi-automatic rifle and two handguns were recovered. The gunman, whose name has not been released as of the day of the shooting, was shot and killed by the sheriff's deputies. monday 13 wife of a gunman who went on a shooting rampage in a Northern California town was found dead inside their home, authorities announced Wednesday, raising the death toll from the attack to five. Investigators discovered the body of Kevin Janson Neal’s wife hidden under the floor. kinn sidd Please read afghanistan news like khaama press, tolo news, pajhwok, you will immediately understand and relate what is happening. The mass shooting in the last three months are not random but well organized terror attacks to avenge the killing of taliban fighters at the hands of U.S.
Stephen paddock, omar mateen and saifulla saipov all lived in the tampa-orlando, florida area between 2013- 2015 and then all them committed mass murder in within a span of 1 year this is not coincidence. This shooting was orchestrated by the Pakistani Consulate in Houston in order to avenge the killing of Taliban fighters by U.S airstrikes in Afghanistan. Yesterday(4th NOV 17), 15 important Taliban fighters were killed in Nangarhar Province, Afghanistan in an U.S airstrike. Devin Kelly was brainwashed by Pakistani intelligence agents and then send to carry out this rampage. He and Las vegas shooter both committed suicide after killing people. The order to carry out these mass shooting is sent via encrypted messengers like whatsapp and telegram. kinn sidd his shooting was orchestrated by the Pakistani Consulate in Houston in order to avenge the killing of Taliban fighters by U.S airstrikes in Afghanistan. Yesterday(4th NOV 17), 15 important Taliban fighters were killed in Nangarhar Province, Afghanistan in an U.S airstrike. The only question to ask when there is a "terrorist attack” or “mass shooting" is this: Is it a hoax attack carried out by the government in which everything is staged and no one is killed -- like the July 12, 2012 Aurora, Colorado “Joker” movie theater shooting; the December 14, 2012 Newtown, Connecticut Sandy Hook school shooting; the April 15, 2013 Boston Marathon bombing; the November 1, 2013 Los Angeles International Airport (LAX) Terminal shooting; the May 23, 2014 Isla Vista, California “Elliot Rodger” shooting; the June 13, 2015 Dallas, Texas Police Headquarters bombing; the June 17, 2015 Charleston, South Carolina church shooting; the August 26, 2015 Moneta, Virginia WDBJ “live TV” newsreporter shooting; the October 1, 2015 Roseburg, Oregon Umpqua Community College shooting; the December 2, 2015 San Bernardino Inland Regional Center shooting; the 2016 Orlando, Florida Pulse Nightclub shooting; the May 22, 2017 Manchester Arena Ariana Grande concert bombing; the October 1, 2017 Mandalay Bay shooting; and the November 5, 2017 Sutherland Springs church shooting? Or is it a false flag attack carried out by the government in which people are killed -- like the February 26, 1993 World Trade Center bombing; the April 19, 1995 Oklahoma City bombing; the September 11, 2001 World Trade Center/Pentagon attack; and the July 7, 2005 London subway bombings? The sad truth is that the government is the enforcement division of the international corporate elite, and the corporate media is the propaganda division. The government can create any fictional scenario it wants, and the corporate media will back it up completely. Choo Choo ot sure if this warrants news coverage. Nowadays, school shootings happen almost daily in the United States. Plain Truth America: Get your own house in order rather than a becoming global policeman, spreading chaos, hatred and killing innocent civilians around the world. kookoopants This too could be staged! " “I am told at this point the suspected shooter is deceased by law enforcement bullets.” Who the heck talks like this? Its fake language used to sell a narrative. I don't buy it unless I see the bodies folks Nor should you! Fake gun confiscation news. We learn to ignore these things. FUSA The exceptional nation strikes again! “There is nothing to indicate this is terrorist related” So the shooter wasn't Muslim. Las Vegas Shooter At Mandalay Bay Hotel Part Of FBI Undercover Sting Operation That Went BAD! The gunman also rammed a car into the gates of Rancho Tehama Elementary School and shot at its portable classrooms2. Michelle, a former teacher who worked in social services, died after being shot at point blank range at least four times. had been driving into town for a doctor's appointment on November 14, when they saw a white pickup bearing down on them, which crossed into the oncoming lane, as if to crash into them head on. roy swerved to avoid the truck, but the driver barreled into the side of his Ford Crown Victoria car, T-boning it. the driver's door was so badly damaged, that they couple had to climb out through the passenger's side. They had just clambered out the vehicle when they heard gunfire and saw Neal approaching them, with his gun drawn. 'I look over my car, (over the roof) and look down the hill and this guy is drawing a bead with his pistol … He starts firing in our direction and I say to my wife 'Run! Run! Let's go!' he told the Detroit Free Press. he told the Detroit Free Press. Rancho Tehama shooting: ‘Run! Run! Let’s go!’ man told wife before being hit Detroit free press still vividly remembers the shooter running him off the road, methodically killing his wife, Michelle, shooting him twice and leaving them both in a ditch by the side of the road. “I’m still having moments of flashbacks thinking about that truck coming toward me, just missing me,” McFadyen said. “And being shot and watching my wife.”said he and his wife were driving out of town Tuesday morning for a doctor’s appointment when they saw a white pickup coming down the road toward them. The driver crossed into the oncoming lane, as if to crash head-on into the McFadyens. We’re panicked and the gunfire is just coming, he’s coming up the hill, firing his gun,” he said. McFadyen and his wife became separated. She fell in a ditch, while he headed up Stagecoach Road on foot. He looked up and saw the man firing at him. One of the bullets hit his left leg and went through his thigh. The shot stung, but he could still walk. A car drove by and McFadyen tried to get them to let him in, but they locked their doors and drove off, he said. As McFadyen ran, Neal shot him in the right lower leg, shattering bones. He fell in the road and tried to sit up. At that point, Michelle McFadyen came up the road toward him and Neal began firing at her. She falls in the ditch and he walks up rather casually and puts two rounds in her. All the while I’m screaming, ‘Please don’t! Please don’t!’” McFadyen said. Michelle made a noise, so he turned back and shot her at least two more times, he said. “So after he shoots her a second time he turns around and starts coming toward me again. At which point I lay back on my back and I say ‘I’m dead! I’m dead! I’m dead! '” McFadyen said. Neal drove up the road in the gray car toward McFadden as if he was going to run him over. McFadyen, however, was able to pull himself off the road and down into the ditch near his wife. Neal drove off out of sight. The gunman's next stop was the Rancho Tehama Elementary School, according to the sheriff's office. Awful New Details About The Brave Mom Shot Multiple Times Saving ... yahoo nov 19 After seeing Neal approaching, she quickly threw herself over her 10-year-old son, ... Tiffany Phommathep Tehama County mass shooting ... dropped her children off at Rancho Tehama Elementary School. ... Phommathep had to drive several more miles before she was finally able to flag down a police car. Updated 10:32 AM ET, Fri November 17, 2017 The gunman was a man Gage knew and feared: his neighbor Kevin Jason Neal. "He shot at their house," Gage's maternal grandmother, Alma "Sissy" Feitelberg, told CNN. "Yeah," Gage said. "He did, at least three times a day." Then Gage went silent. Gage was just 22 months, his mother, Cher, died unexpectedly. She was 28 and battling physical pain that she tried to kill with opioids, Feitelberg said. RANCHO TEHAMA, Calif. - Brian Flint said he was in Redding going fishing when he got a call saying his roommate had been shot. When Flint returned to his home he found that the suspect had killed his roommate and then stole his truck. Flint said that he knows the man who would go on to murder four ..He lived two doors down from him. Flint described Kevin as a crazy dangerous man and spoke about how Kevin would shoot up to 100 rounds of gunfire every night and morning. "All I know is that the guy shoots a lot of shots and it's just crazy. I would hope that there would be more effort into preventing things like this. The police came around my house a lot recently, maybe it was for gunshots, maybe not, not sure but you know, there just needs to be more of an effort for things like this to be prevented," said Flint. Flint said that his roommate had just turned 57-years-old and was a very nice man. He said he felt guilty knowing that the suspect used his car to carry out such a horrendous act. neighbor he was accused of stabbing obtained a restraining order against him in February, writing to the court that Neal fired guns to scare people in her house and alleging that he was “very unpredictable and unstable” and that he had “anger issues,” according to court documents. “It’s almost like they think we’re lawless out here and they just don’t care,” he said. The Tehama County Sheriff's Office on Thursday released the names of the five people killed by a gunman who rampaged through Rancho Tehama on Tuesday. additional six adults and six children — four boys and two girls — were wounded. Three of the children were treated and released at the scene, two were treated and released from a hospital and one remains hospitalized. 18 hours ago - (KCRA) —. Officials released the identities of the people killed and injured in the TehamaCounty shooting rampage. Kevin Janson Neal, 44, shot and killed five people and injured 12 others during a shooting spree Tuesday morning through Rancho Tehama, a small town near Corning. Neal was shot and killed by officers. 18 hours ago - "He caused a lot of trouble. The last eight months, it went from zero to 100 real quick," said Johnny Phommathep, who lives near Kevin Neal. 21 hours ago - The victims were the boy's grandmother and father, respectively. Sissy Feitelberg, whoidentifies as Gage's maternal grandmother in Sacramento, created the page to support the boy, who has been left an orphan. A report by KCRA-TV in Sacramento said the victims lived next to Neal and had an ongoing dispute with him. 6 hours ago - Officials say 44-year-old Kevin Janson Neal killed five people and injured 12 others during the shooting rampage. Neal's wife was also found dead inside their home. wo of the guns used in the Tehama County mass shooting Tuesday were ... Despite owning numerous weapons, Neal had a restraining order filed ... Cal Fire to complain that the two women were making methamphetamine. California man killed & buried his wife before going on fatal shooting spree RT 1 Northern California man who killed four people in a shooting rampage did so one day after killing his wife and burying her under the floor of their home. The man went on to wreak havoc, death and panic throughout a small community. 19 hours ago - In the chaos of the moment, he called Mike McFadyen and yelled into the phone, "They shot at us. Michelle is lying dead at my feet. She's dead. photo: crown victoria wrecked on left rear fender , chain link fence crashed , bullet holes in wood paneling classroom wall. James Woods Sr. and James Woods Jr. were also doing a simple chore when mayhem hit. They were checking for mail when the gunman fired from behind, according to Ashley Oleane Paez, James Woods Jr.'s girlfriend. Paez said the younger Woods, 20 and a father of two, had come out of his first surgery successfully. www.sacbee.com/news/local/crime/article184754473.html20 hours ago - Tehama shooter began spree by killing his wife, hiding her body, ... Sheridan Orr of Cary, N.C., identified her as the former Barbara Glisan. Romero lived in New Bern before moving to California in 2012. She lived right next door to shooter Kevin Neal for two and a half years. She recalled the moment she found out the news and immediately called the neighbor living on the other side of Neal. Romero said by this point, Neal had shot his own wife and two of his neighbors. Police believe he went on a shooting spree throughout the town of nearly 1,500 people. “He just started shooting anybody he saw he shot at,” Romero said. www.foxnews.com/.../several-dead-children-wounded-in-shooting-near-california-eleme...10 hours ago - close. Authorities: Shooter killed at Rancho Tehama school. ... added of the shooter, noting he doesn't think there is any connection to terrorism. Nov 16, 2017 - AP Photo/Rich Pedroncelli Two women embrace outside Rancho Tehama Elementary School, where a gunman opened fire Tuesday, Nov.
16 hours ago - There were multiple deaths after a shooting in Rancho Tehama that ... The only thing that will stop these terrorist organizations is a bullet. Andy Slavitt (@ASlavitt) A gunman just shot up an elementary school in CA. Kids are dead. News isn't showing it. This is a public health crisis of epic proportion. 3 hours ago - A gunman killed four people and left at least 10 injured in a shooting ... sprays bullets into a school while terrorizing a Northern California town. November 14, 2017 Rancho Tehama Mass Shooting Not Terrorist Attack Kevin Neal​ opened fire at Rancho Tehama School in Californa , killing three people. The shooting started at a home where he killed his wife Barbara Glisan. and 3 neighbors and moved to the elementary school in Tehama County​ at around 8 am. At least three people were killed, two people were wounded, and many were left injured. The shooter was killed by law enforcement. A man reported that his truck was stolen and his roommate was shot and killed by the gunman earlier in the morning. Authorities announced they believe he as angry at his neighbors and was not a terrorist attack. Terrorist theory: The mass shooting in the last three months are not random but well organized terror attacks to avenge the killing of taliban fighters at the hands of U.S. Stephen paddock, omar mateen and saifulla saipov all lived in the tampa-orlando, florida area between 2013- 2015 and then all them committed mass murder in within a span of 1 year this is not coincidence. january: judge had issued a restraining order against the gunman after the dispute with the neighbor in January. Neal was arrested on Jan. 31 for the incident with his neighbors in which he reportedly shot through a fence at two women, according to the Red Bluff Daily News. He jumped over the fence, stabbed one of the women and then took the other's cellphone, the prosecutor said. accused of stabbing a female neighbor in the abdomen. The charges — which include assault with a deadly weapon and second-degree robbery — were pending, and the neighbor was among the first to be killed Tuesday. mother paid for lawyer and bail Family mother posted his $160,000 bail and spent $10,000 on a lawyer after he was arrested in January for stabbing a neighbor. Neal's mother ..
mother phone call: “Mom it’s all over now,” she said he told her. “I have done everything I could do and I am fighting against everyone who lives in this area.” She said Neal apologized to her during their brief conversation, she thought for all the money she had spent on him, saying he was “on a cliff” and the people around him were trying to “execute” him. subject of a domestic violence call the day before the attack. began his rampage near his home on Bobcat Lane in the Rancho Tehama Reserve at 7.52am, shooting people at random before stealing a truck and performing drive-bys on homes, pedestrians and other drivers. Brian Flint man staying in his house was one of those killed and that some of his neighbors were among those who were shot. Neal fired at several people, killing one man in his driveway. On his way through the town, he shot a woman and her child in their F-250 truck The mother suffered life-threatening wounds and remains in hospital, towed away with bullet holes in door. latimes Neal fired eight rounds into a Ford F-250 occupied by a mother and her son who were headed to school. The boy suffered non-life-threatening wounds, but the mother was seriously injured, Johnston said. The mother, who had a concealed carry permit, pulled out her own handgun but was unable to fire it before Neal drove away, Johnston said. redding Mike McFadyen, 59, spoke to the Record Searchlight his brother and sister-in-law Troy and Michelle McFadyen were forced off the road and into a ditch by a vehicle coming at them head-on. The gunman then parked the vehicle, walked toward them and fired into their car , his brother and sister-in-law were forced off the road and into a ditch by a vehicle coming at them head-on. The gunman then parked the vehicle, walked toward them and fired into their car. With no way of defending themselves, they ran for their lives, said Eric McFadyen, their nephew and Mike's son, on a GoFundMe page. But the gunman ran them down until they fell to the ground. On November 14, 2017, a shooting spree took place in the unincorporated community of Rancho Tehama Reserve in California, about 120 miles (190 kilometers) northwest of Sacramento. The spree resulted in six adult deaths, including the gunman, and ten injuries. Two of the injuries occurred at the Rancho Tehama Elementary School. Further injuries and deaths were prevented after the school was placed on lockdown when shots were first heard. The shooter was later identified as 44-year-old Kevin Janson Neal. His rampage started after he killed his wife and hid her body under the floorboards of their home. Kevin Neal, who had stolen a pickup truck, was shot and killed by Tehama County Sheriff deputies after a brief vehicle chase. The 45-minute attack was spread over eight crime scenes using one semi-automatic rifle and two semi-automatic pistols. His motive is unclear. Injured victims, including two children, were taken to Enloe Medical Center in Chico. No children were killed. Several of the shooter's relatives are missing, according to authorities. Governor Jerry Brown, and his wife Anne, offered condolences to all the victims and their families. ^ St. John, Paige; Tchekmedyian, Alene (November 15, 2017). "Despite court order to give up weapons, Tehama gunman fired guns with impunity, frightening neighbors". Los Angeles Times. Retrieved 16 November 2017. Jump up^ "Rancho Tehama gunman killed his wife and hid her body under their home, authorities say". Los Angeles Times. November 15, 2017. Archived from the original on November 15, 2017. Retrieved November 15, 2017. Jump up^ Chan, Stella; Mossburg, Cheri; Sanchez, Ray; Almasy, Steve (November 14, 2017). "4 dead after California shooting; gunman tried to enter school". CNN. Archived from the original on November 14, 2017. Retrieved November 15, 2017. Jump up^ Helsel, Phil; Abdelkader, Rima; Dong, Shanshan (November 14, 2017). "Gunman kills four, wounds child at school in California shootings". NBC News. Archived from the original on November 14, 2017. Retrieved November 15, 2017. Jump up^ "Red Bluff deadly shooting: Gunman identified". ABC7 Los Angeles. November 14, 2017. Archived from the original on November 15, 2017. Retrieved November 15, 2017. Jump up^ Domonoske, Camila; Gonzales, Richard (November 14, 2017). "At Least 4 Victims Killed After Shooting At School, Other Locations In California". NPR.org. Archived from the original on November 14, 2017. Retrieved November 15, 2017. Jump up^ Kasler, Dale; Sabalow, Ryan; Chabria, Anita (November 14, 2017). "Locked out of school, Tehama County gunman shot at children from outside". The Sacramento Bee. Archived from the original on November 15, 2017. Retrieved November 15, 2017. Jump up^ Shyong, Frank; Panzar, Javier; Serna, Joseph; Saint John, Paige (November 14, 2017). "Terror in Northern California town as gunman goes on rampage, sprays school will bullets". Los Angeles Times. Retrieved November 15, 2017. Nov 14, 2017 - Neal shot and killed four other people and wounded 10 at different locations around the rural community of Rancho Tehama Reserve. Police later shot ..... Yes his mom and sister, they knew he was nuts and delusional....and spent $160,000 to get him out of jail...instead of a mental hospital.